Rosu Fridez Rodica, Switzerland - bpw-leadershiplifelonglearnings Webseite! Born in Romania Rodica worked in several East-European countries and has lived in Switzerland for 10 years. She has over 15 years of experience as a learning and development professional in personal and business settings; as a sales trainer for a multinational company in Europe then as a professional trainer in Switzerland. 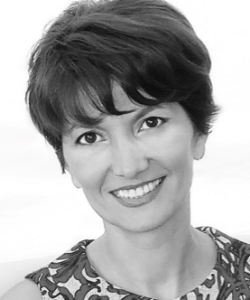 Rodica has acquired extensive experience in multinational and small & start-up companies, covering training, people management, marketing communications and direct sales. Within these roles she has successfully designed and delivered tailored training programs in leadership, team management, sales and communication skills. Her strong desire to apply her knowledge has led her to work as an independent trainer and consultant. With a Master degree in Human Resources Management and a Bachelor in Communication and Public Relations, she set up and manages SR Communication, specializing in training, marketing communications and consulting. She joined BPW Jura in 2012 and became a certified PEP Trainer for the French speaking part of Switzerland. In 2015 she joined BPW Lausanne and is a board member since 2016.